With the aim to contextualise humanitarian essentials orientation for forefront humanitarian workers and implementation managersworking in Cox’sBazar in terms of quality and accountability to make response program more effective, National Alliance of Humanitarian Actorsin Bangladesh (NAHAB) with financial support from DAM-ELNHA project of OXFAM organized the “Orientation on Humanitarian Essentials”. Coast Trust and Humanitarian Leadership Academy is providing technical support to this Orientation. The basic content of this orientation were International Federation of Red Cross Code of Conduct, Core Humanitarian Standard (CHS), Sphere Standard and right to minimum standard, Dignity of affected population, Stress management in Emergency, Gender and Inclusion in emergency etc. In the very beginning on 30-31 March 2018 NAHAB organised the Training of Trainers (ToT) for 20 participants who are now facilitating this orientation. Mr. Mohammad Abul Kalam ndc, Refugee, Relief and Repatriation Commissioner (RRRC) honoured the chair of Chief Guest.He encouraged this initiative and shared valuable context basis examples with the participants.Ms. 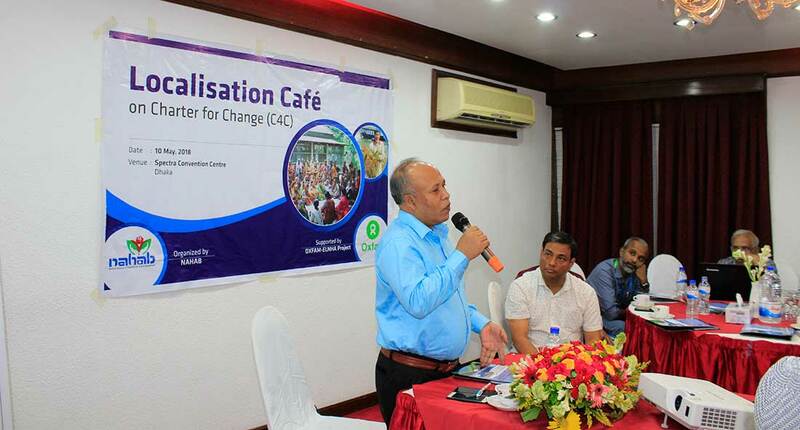 Shamnaz Ahmed, Humanitarian Capacity Building Coordinator, OXFAM, Bangladesh; Mr. Md. Jahangir Alam, Head, CC & DRR Sector, Dhaka Ahsania Mission; Mr. Abu Morshed Chowdhury, Executive Director, PHALS and Vice President, CSO Forum were also present there. In continuation, the ToT receivers later facilitated one (1) day residential orientation for 201 humanitarian practitioners in eight different batches dated on 8, 9, 22, 23 April’18 in Hotel Uni Resort Cox’sbBazar. At least 40 organisations including UN agencies, International, Local and National NGOs nominated their participants for this orientation. It has been already identified as an immediate kick start of the capacity enhancement endeavours. In this Orientation program several distinguishes named Mr. Sumon Das, Project Manager, ELNHA project, OXFAM; Ms. Subarna Saha, Senior Influencing Officer, ELNHA project, OXFAM; Mr. Dr. Khawja Shamsul Huda, Director- Program, Dhaka Ahsania Mission; Mr. Dr. M. Ehsanur Rahman, Executive Director of DAM& Chairperson of NAHAB have extended their support at different level.